"Zerøx", "Kings of the Wild Frontier" [alternate], "Physical(You're so)" [live 1980], "Prince Charming" [alternate], "Room at the Top" [extended], "Rough Stuff" [Extended]. We don't get all the old and rare clips as mentioned for the rumoured "Digital Tenderness" collection. But since it is very unlikely that we will ever see that one released, we will have to do with what we get here. And quite honestly, it is indeed a very fine collection. The second disc is a documentary told by Adam and old friends including Marco Pirroni. 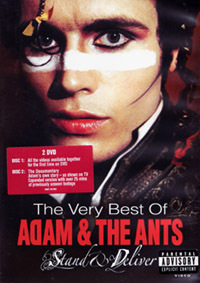 This documentary combined with the recently released book gives many a detail about Adam's career and life. A special bonus: SputnikFred known by many a Sigue Sigue Sputnik fan from Sputnik gigs in recent years, pops up near the end of the documentary, at a book signing in London, dressed in full Ant-style cavalry jacket.